Consumer products make up a large part of the waste generated worldwide. The world generates more than 1.3 billion tonnes of solid waste annually, according to a report published by Harvard Business Review. This is expected to grow to 2.2 billion tonnes by 2025, with the OECD countries responsible for 44% of waste. In the US alone, the average person throws away their body weight in rubbish every month. Why is this important? Let’s stay focused on the US for a moment. In the US, about 80% of what Americans throw away is recyclable, yet the recycling rate is only 28%. To bring this into perspective, every month Americans throw out enough glass bottles and jars to fill up a giant skyscraper, but all of these jars are recyclable. Consumers are starting to pay attention. In a recent survey of 54 of the world’s leading brands, almost all reported that consumers are showing increasing consciousness of sustainable lifestyles. A recent Unilever research study revealed that 33% of consumers are choosing to buy products from brands that honour the environment and social responsibility. The study uncovered that approximately half (53%) of UK consumers claimed to feel better when they bought sustainable products. In the US, this statistic rose dramatically to 78%. Consumers are no longer just looking at price and performance when making purchasing decisions. Today consumers prioritize brands that promote sustainability as they seek ways to make an impact with their personal behaviour. ● a closed-loop process for recycling that both encourages and rewards participation by consumers and supports the re-use of materials in the circular economy. The good news is that brands are investing downstream in their sourcing, manufacturing and distribution processes to improve their capacity for sustainability. The challenge is making this information available to consumers. With strong consumer awareness, sustainability within the supply chain becomes a competitive asset for brands; strengthening brand trust and authenticity for consumers and winning market share. So how do brands consistently inform consumers? In a recent global survey by Nielsen, 81% of global respondents felt strongly that brands should help improve the environment. This passion for corporate responsibility is shared across gender lines and generations. Millennials, Gen Z and Gen X are the most supportive, but their older counterparts aren’t far behind. This said, few consumers will take the time to fully research a brand before purchasing, so brands who make sourcing and sustainability information easily accessible on product packaging will win at point of purchase. And to really make a sustainable global impact, it is imperative that brands engage consumers as part of the product’s sustainability journey. After all, what happens to a product and/or its packaging post purchase is just as important as how it is sourced. To do this, brands and retailers are beginning to engage consumers in scalable and practical recycling programmes. While innovations in textiles, packaging materials and production processes are themselves helping to reduce the impact of waste produced by consumerism, the fact is physical goods are – well, physical – and will always create an impact post purchase. The key to a truly circular economy is the ability to recapture materials after the point of consumption and bring them back into the sourcing and production ecosystem. This kind of recycling at scale is the pathway to closing the loop on global supply chains. ● and finally, to close the loop, the economies linked to the materials recovery process must be viable – helping to drive and incentivize consumer recycling behaviour. Over the past two years, the digitization of consumer products at scale has become an economic and logistical reality. Last August saw GS1, the world’s standards organization for product coding, launch GS1 Digital Link, an upgrade to the global barcode standard. This upgrade turns the standard code, tag or label that appears on every product item into both a digital trigger and a tool to connect every product to the web. With more than 2 billion iOS and Android smartphones already able to automatically interact with standard QR codes, the new GS1 Digital Link standard takes this one step further – connecting every product to every consumer. This upgrade coincides with the maturity of digital serialization packaging technology, making it possible for mass market products to be individually digitized (both on-pack and in-product) at high volume and extremely low cost. Billions of consumers with smartphones around the world can now interact with and transact with product items simply by pointing their phone camera at a product – a hugely powerful channel to both deliver information, provide services, capture data and build direct consumer relationships. GS1’s work to ensure every product label, tag or code connects to the web and with every smartphone, also means that every product item can connect with its own digital identity in the cloud. This digital identity – the digital twin – allows information from and about an individual product to be managed throughout its lifecycle. A smartphone scanning the product can both access web-based information and services linked to the item, and contribute information to the tracking of the product’s journey through the global supply chain – from sourcing to manufacture, to purchase, to recycling. We are now at a point where every product item – whether a chocolate bar, or can of soda, or sachet of washing liquid, or luxury handbag – can be digitally identified, tracked and data-managed throughout its lifecycle. Marketers talk about the “moment of truth” when a consumer makes a purchasing decision. Digitized products create the opportunity for brands to demonstrate the investment made downstream in the supply chain at the moment of truth, using it to win over consumers who seek sustainability credentials and transparency in the brands they purchase. Through the technological advancements in mass-scale product digitization, brands can make the provenance and sustainability credentials of their product items directly accessible to consumers through the product item itself. Once consumers have a product in hand, the next step in global sustainability is to make recycling simple post consumption. Until recycling is an easy, directly accessible and immediately rewarding experience, consumer adoption is going to be limited. Why? Because tossing something away is always the easiest and most convenient option for disposal. For this reason, local and national governments must come together with brands and retailers to facilitate and encourage mass-scale consumer adoption. ● individual perceptions about the importance of recycling. Ultimately, recycling is behaviour. It is important, therefore, to understand the factors affecting recycling behavior and how we can address those factors to prompt desired behaviour changes. For instance, just take a look at behavioural differences between generations. The generational divide in sustainability is fuelled by technology. According to Nielsen, sustainable shoppers in the US are 67% more likely to be digitally engaged, which means they are used to having the products and knowledge they want right at their fingertips. With their devices playing a significant role in their purchase decisions, a simple and frictionless shopping experience between on and offline is critical. As an example of recycling enabled by digitized products, my company, EVRYTHNG, launched a recycling programme at Carrefour supermarkets in Spain, in October 2018, working with our partner Recycl3R. Carrefour, a globally recognized supermarket chain operating more than 12,000 stores in 30 countries worldwide, is committed to reducing the environmental impact of the products its stores sell, and to promoting and defending sustainable development in all of its activities. Working together, we are transforming the way consumer packaged goods are recycled – specifically through connected packaging – making recycling easier, and more transparent. Reciclaya – powered by EVRYTHNG – allows customers to determine how to recycle individual products. The app separates products into virtual recycling bins so that customers can then place them into the closest corresponding containers. Consumers are rewarded with points when they recycle, which can be used to receive discounts on participating products. Having a financial incentive tied to social good drives engagement and action. 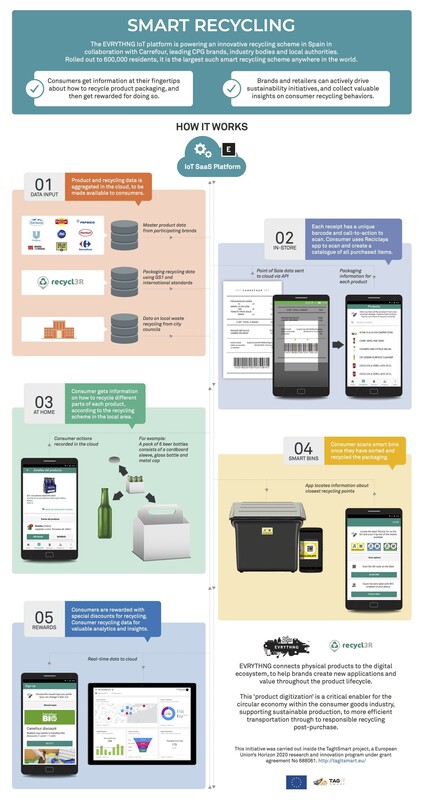 The Reciclaya app and programme with Carrefour has 10 major consumer product brands participating, including Mahou San Miguel, PepsiCo, Henkel, Unilever and Procter & Gamble. And tens of thousands of consumers are engaging monthly across the first two cities activated. The programme demonstrates some important attributes on a limited scale that point the way towards large-scale programmes. Specifically, we believe the unique combination of transparency and gamification is a powerful way to engage consumers in the short-term while transforming recycling habits for the long-term. Early results are proving this assumption true. Clearly there is a fast-growing demographic of consumers who care about the environment and want to do the right thing. Our approach is simple. Make it as easy as possible for consumers to find and understand how to recycle their product packaging, and reward them for doing so. We monitor social media sentiment closely and have been excited to see a continued buzz around the initiative. It looks like consumers are enjoying the “feel good” factor of doing the right thing. The Carrefour Reciclaya app joins other pioneering programmes by game-changing brands – from TOMS shoes to Patagonia – that are making sustainability initiatives core to business plans. For instance, Coca-Cola has committed to collect and recycle one bottle or can for each one it sells by 2030. Dunkin’ Donuts has publicly stated it will try to stop using foam cups by 2020. Retailers and manufacturers in the apparel, footwear and electronics industries have launched programmes to incentivize consumers to preserve products rather than discard them to landfill. Nudie Jeans of Sweden offers free denim repair at 20 of their shops. While Patagonia has partnered with iFixit to teach consumers how to repair clothing to prolong the life of garments. In Brazil, Adidas runs a shoe recycling programme called “Sustainable Footprint”. Customers can bring shoes of any brand into the store to be shredded for use as alternative fuels and raw materials, rather than being sent to landfill. Obviously all of these initiatives are important, exciting and tremendously valuable, but we still have a long way to go from niche programmes to mass sustainability and recycling. Looking to 2019 and beyond, sustainability will remain an active discussion. We know we need more transparency about the environmental impact of various materials and clearer communication around recycling methods. The good news is that industry leaders in both the private and public sectors are coming together to move the initiative forward, sharing best practices, experiences, technologies and methodologies to support sustainability and recycling on a mass scale. In particular, I’m excited about the work we’re doing with the World Economic Forum’s Accelerating Sustainable Production initiative. And, as a company, we will continue to grow our own digital ecosystem in support of sustainability and recycling initiatives. The bottom line is that we all need to be taking steps in a sustainable direction, working together as a global economy to build consumer awareness and mandate supply chain transparency.